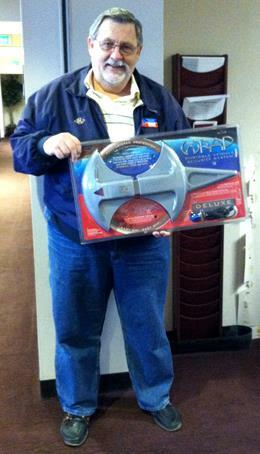 Don Hoperich is one of the lucky winners. PALMDALE – The City of Palmdale’s Neighborhood Services Department has announced the winners in their recent portable vehicle security system giveaway. The lucky winners from Palmdale are: Don Hoperich, Susie Peters, Diana Edgel, Jay Walters, Liz Kissling, and Walter Arauz. The portable car security system is valued at $80. The contest was open to Palmdale residents 18 years and older. Entrants simply had to log onto www.cityofpalmdale.org and click on the link to enter the drawing. 1 comment for "Winners announced in security system giveaway"
Those devices only work for the advantage of car insurance companies therefore should be given to car owners for free for paying expensive premiums every month. If thieves want to steal your vehicle they will no matter what deterrent you have. Mine got stolen at gunpoint! What I learned from my experience is that having good coverage is the only way to go. I got a brand new vehicle from what had happened to me.